Description - Getting fit is more complex today than just lifting weights or running on the treadmill. With the advent of Cross Fit, getting fit encompasses more, and with that change, turf has become a crucial floor for any commercial or home gym. 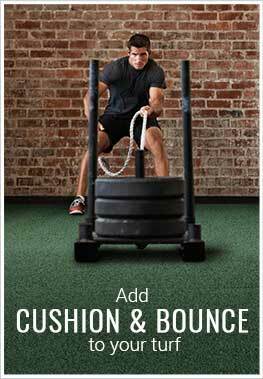 With our Endurance Turf Rolls, you will be able to add artificial turf to your workout space at discount prices. Not only are these fake grass rolls great for working out on, but they are also great as a putting green surface, outdoor patio floor, as flooring for decking and much more. Resistant to fading, mold, and mildew growth, this turf if perfect for any part of the country. Easy to clean and install, these rolls are porous and are backed by a 5-year warranty. Material – 100% HI UV stable polypropylene fiber with a synthetic backing. Weight – .32 Lbs. per sqft. Recommended Uses – Endurance Turf Rolls are great for both commercial and residential use and can be installed indoors and out. These artificial turf rolls have been used as flooring in commercial gyms, home gyms, in Cross Fit gyms, as outdoor patio flooring, as deck flooring, in indoor patios, and much more. Resistant to fading, mold, and mildew growth. Great for pushing sleds on, for outdoor patios, and more.